Icelandic culture is founded upon the nation's Norse heritage. Most Icelanders are descendants of Norse and Gaelic settlers. This historical Icelandic deck was first published in c.1930 and shows the native Icelandic Vikings of some thousand years ago with stern expressions but rendered in a romantic naturalistic style. Their names are given in Icelandic lettering in the ornament separating each end of the design, which also includes Viking motifs. Tryggvi Magnússon (1900-1960) graduated from secondary school in Akureyri in 1919 and then pursued studies in Copenhagen for two years. Then he went to New York League of Art 1921-1922 and studied portrait making. Between 1922-1923 he pursued the study of painting in Dresden. Tryggvi was one of the founders of the Association of Icelandic Graphic Designers and he also designed Icelandic Chess Playing Cards printed by Alf Cooke in 1942. 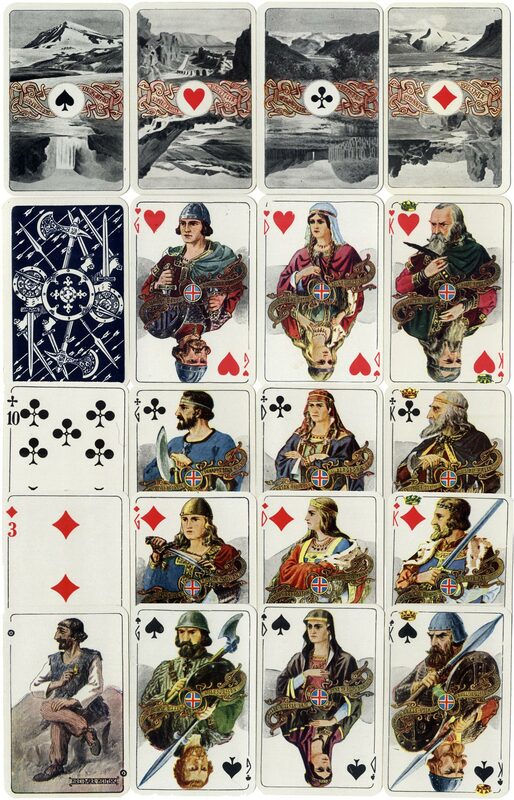 Above: ‘Islenzk Spil’ ~ Historical Icelandic Playing Cards with double-ended illustrations designed by Tryggvi Magnússon (1900-1960) and first published in 1930. 52 cards + Joker + Bridge Score cards in cardboard box. 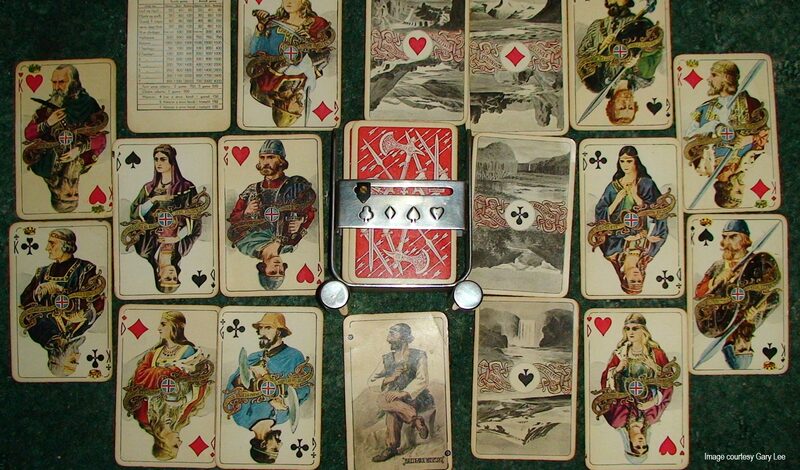 There have been several editions of the deck and this one is probably c.1940 after Magnus Kjaran, whose name appears on the box, had bought the rights. The indices on the numeral cards are not consistent with those on the court cards. More recent editions of this deck have a yellow background. 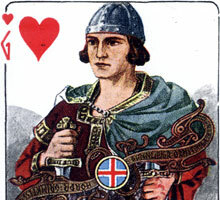 The Joker depicts Hreiðarr Heimski, Hreidarr the Fool, a character from Icelandic literature. • See also: Icelandic Chess Playing Cards (also designed by Tryggvi Magnússon).